لک زایی, شریف. (1397). عدالت در اندیشه سیاسی امام موسی صدر. فصلنامه علمی تخصصی سیاست پژوهی, 5(10), 154-123. شریف لک زایی. "عدالت در اندیشه سیاسی امام موسی صدر". فصلنامه علمی تخصصی سیاست پژوهی, 5, 10, 1397, 154-123. لک زایی, شریف. (1397). 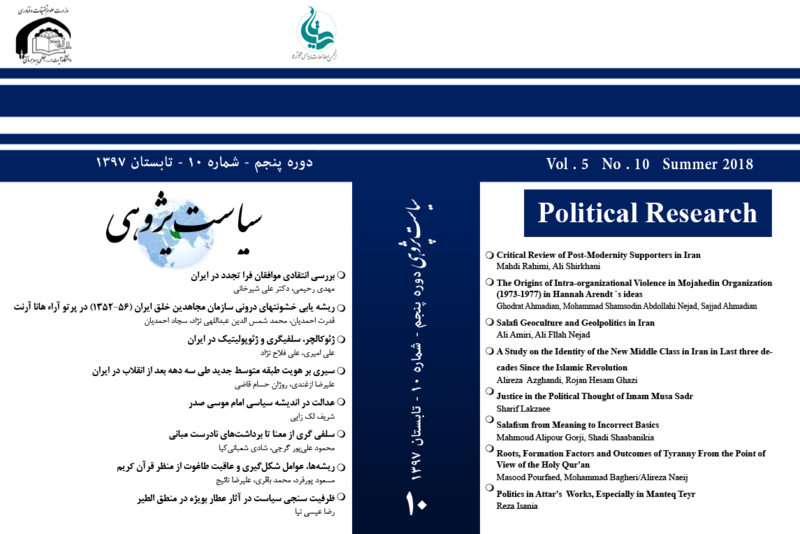 'عدالت در اندیشه سیاسی امام موسی صدر', فصلنامه علمی تخصصی سیاست پژوهی, 5(10), pp. 154-123. لک زایی, شریف. عدالت در اندیشه سیاسی امام موسی صدر. فصلنامه علمی تخصصی سیاست پژوهی, 1397; 5(10): 154-123. یکی از مهم­ترین متفکرین در دورۀ معاصر که به بحث عدالت در نظر و عمل توجه داشته امام موسی صدر است. ایشان در لبنان سعی می­کند هم به لحاظ نظری، بنیاد قوی­ای را برای تحقق عدالت و به خصوص عدالت اجتماعی، عدالت سیاسی و عدالت اقتصادی پی ریزی کند و از طرفی در عمل هم اقدامات و کارهایی صورت می­دهد که منجر می­شود به این­که شیعیان لبنان به عنوان یک طایفۀ بسیار ضعیف، فقیر، تحقیر شده و کرامت از دست داده، ارتقا پیدا کنند و به عنوان یک قشر جا افتاده در لبنان مورد توجه قرار گیرند و بتوانند هم در سرنوشت خود و هم در سرنوشت جامعه­ خود تأثیرگذار باشند. فرضیه مقاله این است که به نظر می­رسد در نگاه امام موسی صدر، عدالت، افزون بر این که مسأله­ای فردی است اما همچنین به عنوان مسأله­ای اجتماعی و سیاسی نیز نزد وی ارتقا می­باید و پیوند بسیار محکم و استواری با ایمان به مثابه یک امر اعتقادی دارد. One of the most important contemporary thinkers who has considered the issue of justice in both comment and action is Imam Musa Sadr. In Lebanon, He tries to establish a strong foundation for the realization of justice theoretically, and especially social justice, political justice and economic justice, on the other hand, in practice, he also performs some actions and deeds that lead to improve the Lebanese Shi'ites who were humiliated and lost their dignity as a very week and poor tribe in to an established community in Lebanon so that they are able to influence on both their own fate and the fate of their community. Indeed, the emphasis of Imam Musa Sadr has been on the issue of justice and attempt to realization of it in the Lebanese society, regardless of the present plurality. From this point of view, he defends the existence of balanced government that can properly distribute the facilities in the diverse Lebanese society. However, the question is how can justice in Imam Musa Sadr's thought have an effective and live presence in the society? It seems that in Imam Musa Sadr's view, justice, in addition to being an individual problem, is also promoted by him as a social and political issue, and has a very strong and steady link with faith as a belief subject. Therefor he states that "moderation and justice are two inseparable Islamic principles that we ask God to obtain them. (Sadr, 2011: 107) in addition, "moderation in behavior and in life and avoiding extremes are essential conditions for people survival." (Sadr, 2011: 145). Thus, Imam Musa Sadr, tried to expand the issue of justice in the Lebanese community by the faith and knowledge support, in this way, along with other tribes, he tries to improve deprived Lebanese Shiite in terms of social, political, cultural and economic.